Many patients ask me what questions they should be asking doctors and clinics about possible stem cell therapies. 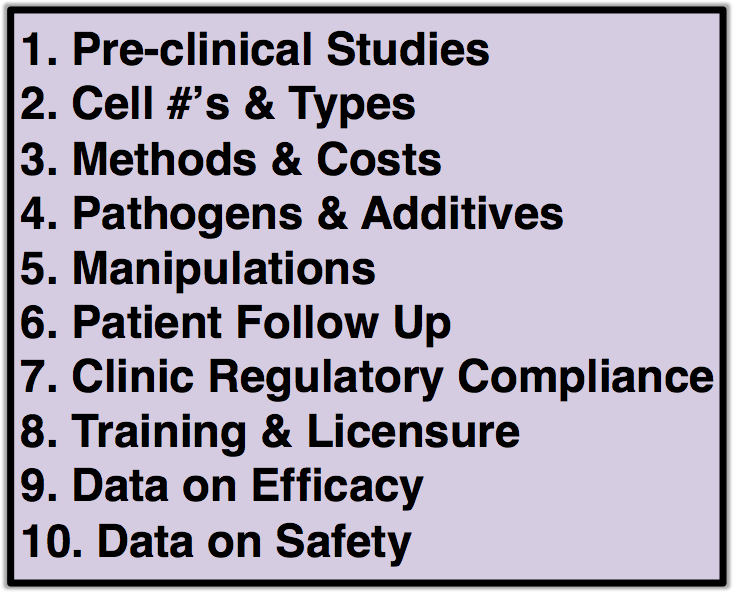 Here is my top 10 list of key items (in both graphic summarized form and detailed text form) that you need to know about and questions about a potential stem cell therapy. Some of these questions are indeed probing, but that’s appropriate when you consider these folks may inject stem cells in your body, a therapy that may never go away completely. It’s not like a pill you can just stop taking. On the other hand, pills certainly have their own risks too. Update: A hat tip to reader/commenter Barbara, who made the point, which I think is an excellent one, that no one doctor or clinic is likely to be able to answer all these tough questions. The list is intended as a helpful tool to get more info for patients as they are weighing risks and benefits, etc., not as a strict test that must be perfectly passed or anything like that. I would also note that this same list could prove very helpful when a patient is considering enrolling in a clinical trial at a university hospital or similar center. 1. Pre-clinical studies. How did the product do in preclinical studies? Did animals such as rats or mice who received the stem cells develop side effects? Did they show evidence of efficacy? How long did the transplanted cells stay in the body of the animals? Were the studies published? If there are no pre-clinical studies, why not? Why ask about this? The goal here is to determine whether any pre-clinical studies were performed. If not, this raises a red flag. They may say there have been lots of studies performed on this cell type by other people but there is a high degree of likelihood that their product is slightly different than the one used in such studies (perhaps sourced differently, processed differently, etc) even though it is a similar type of product. Often we don’t know which of these changes may trigger a safety concern. 2. Cell numbers & types. Just how many cells are in the product? Why was this cell number chosen? How were the cell numbers measured and with what accuracy? How many cells are alive versus dead? Might there be too few living cells to be helpful? What types of cells are in this product? How are the different cell types assessed? If it is a stem cell-focused product, how many non-stem cells are present? What does this mean for the therapy? The goal with this line of questioning is to assess how well they know their product. It is not necessarily true that more cells equals better product but certainly if a provider cannot answer simple questions about what their product is made of every time this raises red flags. 3. Methods & costs. How do you administer the treatment? IV? Local injection? How was this chosen? I understand that many clinics recommend more than one treatment, so on average, how many treatments do your patients receive and what is the total cost for each patient on average? How do you decide how much to charge? If the treatment does not work, will you refund my money? This line of questioning is just being a smart consumer and being aware of how the clinic/doctor decided on the best method to give you the therapy. 4. Pathogens, non-cellular components, and risk of xeno or cross contamination. Was the product tested for the presence of pathogens such as bacteria (and endotoxin, a potent poison made by bacteria), viruses, and fungi? Are the test results timely, signed and documented? Besides cells, are there are other things present like growth factors? What are these exactly? Were they added intentionally or are byproducts of the production process? Do they have functional properties such as growth factors? Were the cells exposed to animal antigens called “xeno contamination”? This can happen with growth of cells in fetal bovine serum or addition of synthetic growth factors from non-human species. If the product was exposed to animal materials, how was this matter addressed and documented? What steps does the clinic or company take to avoid cross contamination of one patient’s samples with another patients? This line of questioning is really related to how much testing the provider has done to ensure the product they want to give you is safe. If they can’t address simple questions of safety test performed and data gathered, this raises red flags. 5. Manipulations. How was the cellular product made? Why was this particular protocol used? Do the manipulations have the potential to change the cells? Is the product a drug? If so, is it FDA approved? If not, why not? Does the company have a relationship with the FDA (i.e. have had a dialogue). This line of questioning is useful to try and help you determine (a) how safe the product it and (b) whether or not it is one that is regulated by the FDA or equivalent regulatory authority. The more manipulated a cell product is, the higher the risk is for contamination (so the bar is raised on those safety questions you asked earlier) and the more likely it is that it is regulated by the FDA and should be part of a formal clinical trial registered with the FDA or equivalent regulatory authority. 6. Follow up. What is your clinic’s plan for following up on patients? How long do you do follow up and why was this period of time chosen? What is the plan if I develop a side effect or problem after the treatment? This line of questioning is about (a) being a prudent consumer and (b) knowing whether or not the provider really cares about learning/knowing how patients react to the treatment or they just want to treat you and move on. 7. Regulatory compliance status of business. Is the business compliant with applicable state and federal laws? Ask to see documentation of compliance. For the companies that sell stem cells grown in culture, compliance is particularly relevant and important. 8. Training and licensure. Is the physician or physicians who work there appropriately trained in stem cells and licensed? What was the training exactly and do you have documentation of the training? Does the doctor have training and expertise specifically in your disease? You want a doctor who is truly a stem cell expert with years of experience and ideally experience as well in your specific disease state. For example, it might be riskier for you if you have a neurological condition like MS if you are being given a stem cell transplant by a physician who has no particular knowledge or training in MS or even the nervous system (e.g. a dermatologist or general surgeon). 9. Data supporting the cellular product’s efficacy for this disease, injury or condition. What evidence is there that the stem cell or cellular product will work for the disease in question? Do you have publications? What are the alternatives to the proposed treatment? What are the strengths and weaknesses of the proposed treatment and the alternatives? This line of questioning is also just about being a good consumer. Know what data exists out there to support why this might work. Make your own assessment with your personal physician of risk weighing the speculative nature of this treatment vs the potential risks including that you may be precluding other treatment alternatives. 10. Data supporting its safety. What are the potential risks from the intervention in question? How have patients who have received this treatment fared in the past? Have any patients developed pulmonary emboli (clots in the lungs) or infections? Ask to see documentation of patient outcomes and if possible publications. These questions are important because all medical treatments have risks and safety concerns. As a patient you want as much information as available to make decisions with your doctor about whether a particular treatment is the wise way to go and information about safety is just about as important as it gets. There are more questions that can be asked, but with information on these top 10 items, we have at least gone a long way to assessing whether a specific stem cell-based cellular medicine product is appropriate for use. Disclosure. This post is not medical advice. Stem cell crystal ball: how did my 2014 predictions fare? A couple of things stand out to me in your list. One is that even though you can just stop taking a pill, it’s a fact that several hundred people die everyday from adverse effects from FDA approved medications. Many medications stay in your body for a long time. Prednisone comes to mind. Can you provide comparable death statistics for patients getting treated with their own stem cells? I think it would be prudent for patients to weigh their own circumstances when it comes to the risk of experimental stem cell treatment. It would be very difficult to find a clinic/doctor that meets all of the criteria you have laid out and quite frankly not all of it seems relevant. Life is full of risks and of course it is wise to be cautious, but patients also realize the greater risk may be to take no risks. Also, I would like to see a list of universities that offer specific courses for med students to become licensed stem cell specialists. What exactly should we be looking for when it comes to trained doctors? Thanks for the comments, Barbara. I completely agree with you about pills and other traditional chemical medicines, including FDA-approved ones, having their own dangers and sadly leading to some deaths. To my knowledge there are currently no statistics on biologics such as stem cells vs chemical meds. That would be very interesting. You also have a good point, and I’m going to update the post reflecting your suggestion, that it would be hard to find anyone who can answer all of these questions completely. Patients need to weigh risks of any treatment (whether pill or stem cells) vs the risk of doing nothing. My goal is to help educate so that patients with their doctors can make more informed decisions. I am a big proponent of physician education on stem cells. I would love to see MDs who have had say a year of subspeciality training/fellowship in stem cell-based cellular and regenerative medicine. I published an article on this earlier this year. As far as I know, no institution has stepped forward to be the much needed pioneer in that area. I hope it happens soon as it is much needed. I’m going to post more in the future on what to look for in doctor training. Good post and discussion. I very much support any efforts to actually help patients by giving them education and tools to use in making their on decisions. As you know, I have been critical that our industry has done too much finger-waving, head shaking and tsk-tsking and not nearly enough helping patients make better, informed decisions. I like your list and want to try to contribute some ideas to it and the discussion around it. Firstly, I have two concerns about the list. I worry that #7 and #8 may be misleading. Re #7 there are many products legally marketed in the US and other regulated jurisdictions which contain live cells and do not require ANY overt documentation of compliance at least with FDA or equivalent regulatory body. Certainly there may be state-level facility licenses, etc but there may not be any documentation of compliance for certain types of perfectly legal products such as Osiris’ Grafix which you recently blogged about. Re #8 there are many good physicians in the stem cell field who do not have any formal training with/for stem cells. I would be cautious about setting this bar too high. Conversely there are now several weekend courses physicians can get that give them a certificate in stem cell something or other that are likely not worth the paper they are printed on. 1. Pre-clinical studies. The goal here is to determine whether any pre-clinical studies were performed. If not, this raises a red flag. They may say there have been lots of studies performed on this cell type by other people but there is a high degree of likelihood that their product is slightly different than the one used in such studies (perhaps sourced differently, processed differently, etc) even though it is a similar type of product. Often we don’t know which of these changes may trigger a safety concern. 2. Cell numbers & types. The goal with this line of questioning is to assess how well they know their product. It is not necessarily true that more cells equals better product but certainly if a provider cannot answer simple questions about what their product is made of every time this raises red flags. 3. Methods & costs. This line of questioning is just being a smart consumer. 4. Pathogens, non-cellular components, and risk of xeno or cross contamination. This line of questioning is really related to how much testing the provider has done to ensure the product they want to give you is safe. If they can’t address simple questions of safety test performed and data gathered, this raises red flags. 5. Manipulations. This line of questioning is useful to try and help you determine (a) how safe the product it and (b) whether or not it is one that is regulated by the FDA or equivalent regulatory authority. The more manipulated a cell product is, the higher the risk is for contamination (so the bar is raised on those safety questions you asked earlier) and the more likely it is that it is regulated by the FDA and should be part of a formal clinical trial registered with the FDA or equivalent regulatory authority. 6. Follow up. This line of questioning is about (a) being a prudent consumer and (b) knowing whether or not the provider really cares about learning/knowing how patients react to the treatment or they just want to treat you and move on. 9. Data supporting the cellular product’s efficacy for this disease, injury or condition. This line of questioning is also just about being a good consumer. Know what data exists out there to support why this might work Make your own assessment of risk weighing the speculative nature of this treatment vs the potential risks including that you may be precluding other treatment alternatives. I really do think this is the kind of approach we as an industry should be taking and it is the kind of risked-based approach I’ve also been recommending we take with patients on my blog at http://bit.ly/Uet2aL and http://bit.ly/SebSxv. Thanks, Lee. This is a great comment with extremely helpful suggestions. I am going to revise the post to add under each question the logic, as you suggested, for each one to help make things even clearer. You should also note my comment above in response to Barbara and a few changes I made in the post in response to make it clear that probably no one single clinic/doctor could meet all these criteria or answer all these questions perfectly. It’s just a guide to help get patients talking more with the providers to make more informed decisions with their doctors. This is a great new idea Paul. I’m not sure where you are on this list, but I’d like to eventually share it with family and friends. My recommendation is to keep throwing in simple and easy concepts in order for the lay person to easily interpret (something that appears you have always been doing, especially here). The majority of people I know that are interested in stem cell clinics read gossip magazines and look at “before and after pictures” in brochures. I think your simplistic approach is the right one. Easy questions and red flags that may raise awareness, if not for impacting clinical decision making. In fact, it may not be a bad idea to lay out some of your common misconceptions about stem cells as an introduction, or perhaps the drawbacks or risks in the event that the clinics are unable to produce data.